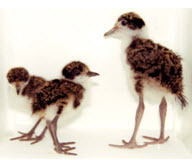 Of the many species of plovers the masked Lapwing is the most commonly encountered. They live in the country, in the suburbs and even on high-rise buildings. They drive their name from the yellow mask on their face. This mask is cream in juvenile birds and develops its full colouring as it matures. The name spur-wing comes from the prominent spur on the top of its wings. This frightening weapon is displayed as a form of aggression but seldom observed to harm its enemies, including people. The occasional scratch is all that has been recorded. They will nest in the most inappropriate places and will defend their eggs and young aggressively, attacking any person or animal that comes near them. They have a spur on the wing that could do considerable damage but they seldom do so. Rather they frighten enemies away by their frightening dive-bombing antics. But, if, because the site is unsuitable, they lose the eggs or young continuously they will not give up but go on persevering for years and years. Constantly chicks come into care having been saved after jumping from high rise buildings or crossing busy roads. Each year my local plovers laid eggs and hatched them on the roof of the bottleshop. This bottleshop is surrounded on three sides by busy roads and the fourth by a car park. Despite the fact that they never successfully reared any young they still kept trying. This young chick was brought to me from the beach nearby and I thought I would try to reunite it with the parents. I took it down to the beach at low tide and on release it called and ran around, then seagulls came down to attack it. Instantly the adult plovers frightened them away. A good sign. The chick then ran to the adult plovers, but they totally ignored it. One plover walked along the wharf closely followed by baby crying for attention. Then at the end of the wharf baby fell through a gap in the planks. 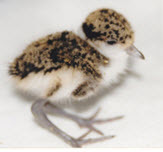 Plovers are not the brightest of birds, and instead of swimming towards the beach he set off for New Zealand. Swimming seemed called for so off with my clothes and in my undies I set off. As you will appreciate, wharfs at low tide are covered with oysters. I caught baby and in the process scraped myself on the oysters. Blood was pouring everywhere, so I bound up my wounds with my skirt and drove home in my wet undies.